The first cohort of 4th year honours Contemporary Screen Acting Students graduate on Friday. This would be as good a time as any to look back and reflect on the first two years of the Programme to assess how we have developed and where we might be going. There was a crucial point in the development of Contemporary Screen Acting at University Of The West Of Scotland and it took place after the initial Accreditation Panel meeting in March 2010. Generally , the panel was very supportive of the notion of a new niche degree in Screen Acting. It would fit snugly between our two other programmes, Performance and Musical Theatre. It would encompass Social Media and the New Technologies, it would arm actors with the skills to navigate the post-web 2.0 world. It would be new and exciting, collaborative and inclusive. But there was one thing missing. The name. The name was going to be “Screen Acting”, but somehow the panel felt that this didn’t suitably reflect the course content. It needed something else. Something to bring it up to date. Now whether it was Dr Sarah Nealy from the University of Stirling, or Ali de Souza from the then RSAMD, someone came up with the term….”Contemporary Screen Acting”. Cheifly I didn’t like it because I didn’t think of it first. In my mind wanted the Programme to have a be simple, short and easy to remember title, and I reckoned it was a bit of a mouthful. But….I had no option. The panel wanted a name change and that was that. Two years later, I love it. The word “contemporary” is one of those plastic, malleable catch all words which immediately fit in any situation where you have just come up with a new idea…and that is exactly what the last two years of Contemporary Screen Acting has been all about. A series of new experiments, new ways of teaching, new ways of learning, new ways of creating work for the small group of screen actors who I have had the privelege of teaching . The small group of graduates (including TWO first class honours) have been the first group of my students to use iPods instead of video cameras, twitter instead of feedback sheets, iMovie instead of Final Cut Pro, a Panasonic AGF 101 instead of an ancient Sony Z-1. 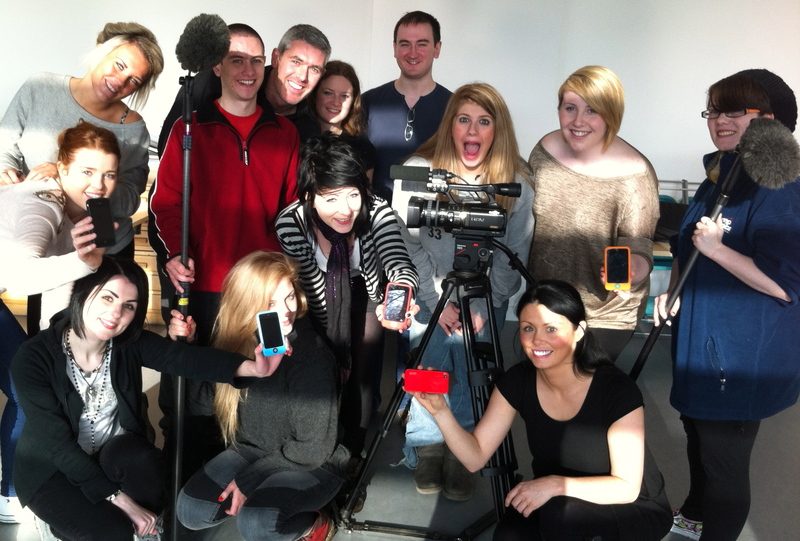 At the same time, they have been the first group of my students to make REAL videos for REAL clients, created their entire corpus of work online in their own showreels, and finally the first group who are able to go out into the world with the skills necessary for success in the connected, networked world of 2012. Some new stuff we tried didn’t work. But thats the nature of experimntation and “contemporary” practice. If it doesn’t work, all you have to do is just not do it again. A bit of a no brainer. Anyway, congratulations to my Honours students, and thanks for the exhilarating journey that the first two years of Contemporary Screen Acting has been. Here’s to the next two. If you want an example of my student’s work, or are interested in studying at UWs, here’s a video which our 3rd years made to market their course. Here’s to the next two years .